Has China’s pollution held back life expectancy? 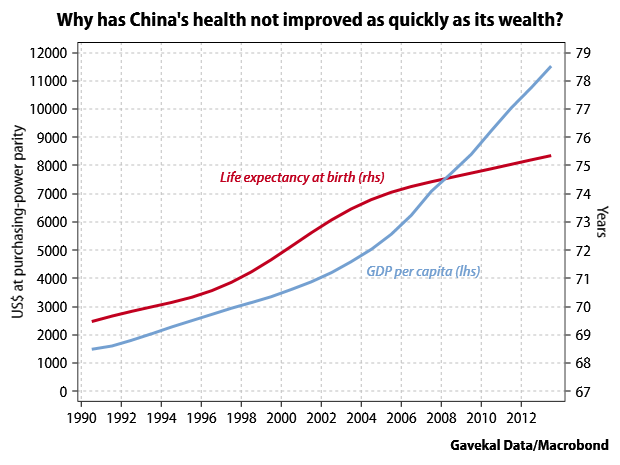 A short and nicely data-focused paper in the latest American Economic Review, entitled “Growth, Pollution, and Life Expectancy: China from 1991–2012,” poses a troubling question: Why has China’s life expectancy not risen even more than it has? While life expectancy has risen over the past two decades, as have incomes, the experience of neighboring countries suggests even greater improvements should have been possible. Infant mortality in China has fallen quite a bit as extreme poverty has been alleviated and improvements have been made in public health, sanitation and hospital care. But adult mortality has not fallen as much as it did in Taiwan, South Korea or Japan, according to the authors. And therefore gains in total life expectancy have lagged. causes of death which are presumably affected by pollution have declined much more slowly than other causes of death. In particular, heart disease, stroke, and lung cancer have remained at similar levels through the 1990s and 2010s, and these cardiorespiratory illnesses now comprise a much larger share of Chinese mortality. In contrast, mortality rates from noncardiorespiratory illnesses, such as communicable diseases, have declined much more rapidly over the same period. Communicable disease mortality rates are very likely to be responsive to hospital construction and public health initiatives, but less sensitive to pollution. As such, the cause-specific mortality trends suggest that China’s income growth has improved health outcomes, but failed to do so for pollution-sensitive causes of death.